CTIA 2006 -- Verizon Wireless today announced that its V Cast music download service now totals over 1 million songs, up from about 500,000 a few months ago. According to the company that makes it the largest mobile music store in terms of selection. A large amount of indie music was recently added into the library, including artists from CDBaby. Sprint Nextel operates a competing mobile music store and has reported over 1 million song downloads through the service. Its music library is smaller than Verizon's. You can watch our video review of both competing stores in action. 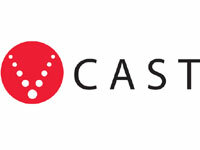 V Cast music was launched at CES this year and uses a dual-mode download--purchasing from a mobile handset costs $1.99 per song while purchasing from a computer costs $.99 per song. In both instances the song can be played on both the computer and phone, the extra fee for over-the-air downloads is primarily for the convenience of having it at any time.